Our hearts are broken… our tears flowing…. our own vulnerable places exposed…. our consciences confounded… our hands reaching out… our ribbons tied…. our candles lit…. and our voices raised in prayer, in confusion, in anger, in compassion to our loving God. Newtown CT is not far. 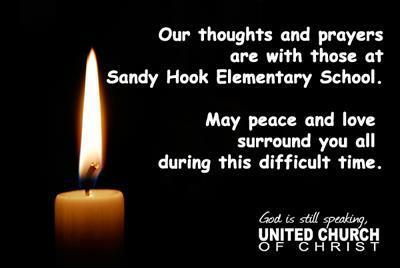 Many in my former congregation (Newton Highlands Congregational Church) join me as this tragedy is one step closer: our UCC pastor in Newtown, CT is Matt Crebbin. While Matt and his family are safe, as pastor of Newtown Congregational Church he and his congregation will be affected in countless ways for the rest of their lives by this tragedy. I join all of you and your congregations in praying for the victims, for all the children in the school, for the shooter and his mother, for all their loved ones, neighbors and friends, and for the community leaders. And I pray for God’s courage to inhabit us all so that we might work together to reduce gun violence as we expand God’s nonviolent rule of justice and love.